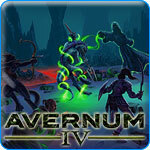 Avernum 4 Game Review - Download and Play Free Version! Rescue the Land of Avernum from the Hordes of Darkness! Graphics aren't the best and might put off some gamers but are similar to previous Spiderweb Software titles. Avernum is a dark, damp underground world where people make a living mining away from the Empire that rules above. The goblins and other nasty creatures that used to run rampant through Avernum have been banished-until now. Now, terrifying creatures and monsters have come in great numbers to attack the people of Avernum! Something even stranger is causing the people of Avernum to fear and distrust everyone. It's up to you to battle monsters and venture through endless darkness to figure out what's happening to Avernum! This role-playing adventure game will keep you busy as you face hordes of goblins, undead-infested mines, the cat-like nephilim and many more unique creatures. Find a lost ring for a dishonored family, discover the secret of a town quarantined by a shade that kills anyone who expresses curiosity about the outside world and much more. Customize your party then begin your adventure. Accept any quests that you want to and talk to anyone that you'd like to. Meet people who want to kill you for helping them, creatures confused about whose side they should support and many other deep characters. The choices you make will influence what happens to you later in the game. Find or buy useful weapons, armor and items for your party members and choose what attributes, like strength and intelligence, to improve when they level up. Will they be good enough fighters when the time for war comes? The unique story, characters and creatures of Avernum 4 will transport you into an intriguing, memorable fantasy world where your choices make a difference in the outcome of the game. With more than 100 quests, this game will provide many hours of exciting gameplay and require strategy to create a strong party that can work together to defeat countless monsters. A wicked darkness seeks to destroy the people of Avernum! Do you have what it takes to battle countless monsters and save Avernum? Avernum 4 is a classic-style role-playing-game and keeps to the tried and true point-and-clicking adventuring of its predecessors. The flexibility in creating your four character team out of warriors, mages, rogues, and many other classes is very well done and lets you pick characters that fit your play style. Fine tune their skills and spells as you level up and explore the murky depths of Avernum in order to form a well rounded team. The wide variety of dangerous creatures, such as goblins, shades, and the undead, which you can fight within the turn-based battle system, keeps the game fresh as you explore all the nooks and crannies of this underground realm. Combat is very easy with entering into action mode whenever an enemy notices you, then simply move your character, cast a spell, or attack when it is your characters turn to move. There is plenty of action to find as well as Avernum 4 boasts tons of quests, more than 100, for you to take on, be it finding a lost ring for a dishonored family, destroying some nasty bugs in the deeper parts of a valuable mine, or translating some ancient scrolls. The non-linear quality to some quests is very interesting as well in that you can choose to just rush into a fight head-on, or you can find a way to sneak around from behind which leaves the game open to your own play style and the strengths within your team at that time. The only down side to this title is that the graphics and animations aren't as good as other RPGs, but fans of any of the other Spiderweb Software games will instantly recognize their hand in developing this game. While this may turn off some new players at first, it is highly recommended to try out the demo because, while it may lack in this one department, the game provides a truly compelling tale and depth of gameplay that more than makes up for it. So if you are a fan of the series, Avernum 4 provides more of the great RPG action these titles are known for and is a great game for new players to sink their teeth into the classic RPG genre. Click above to watch a few minutes of Avernum 4.